Although the overall trends regarding the consumption of added sugars as decreased from 1999-2007, the overall mean intake of added sugars continues to be an area of concern as they exceed the U.S. Dietary Guidelines on recommended intake. Numerous studies show the necessity of sugar on the brains function, however socio-cultural factors, which lead to overconsumption on added sugars, contribute to devastating health consequences. This policy brief will outline the trends of sugar consumption in America, the consequential costs of overconsumption, how to fiscally curb overconsumption, and finally how to use those fiscal gains to reinvest in brain health research spheres. A key feature of the BHISCR is the inclusion of indirect costs of added sugar overconsumption. Currently, the consequences of added sugar overconsumption, when understanding the implications from a general and long terms scope – have drastic consequences on the medical system. When we calculate the cost that the medical systems have to accommodate as an indirect result of sugar overconsumption we see the benefit of continuing the social programs already in place to curb excess. The implications of this policy thus have overarching possibilities. Reinvestment of these unnecessary financial burdens will provide more than sufficient resources to satisfy research and development fields which inherently seek to create new practices and technologies which run counterpoised to the damaging effects that ESC (excess sugar consumption) has on the body, and in particular, the brain. The limitations of this policy report must be delimitated before further analysis of research is disseminated. Firstly, this policy report will serve to provide potentially successful recommendations for regulating overconsumption of sugar, but it does not seek to make this its primary focus, rather, it will show the necessity to put policy in place for the purposes of redistributing those savings into research fields that seek to remediate, and even enhance, brain health. Secondly, the success of the reinvestments is not guaranteed as a product of the redistribution of budgetary expenditure; thus is the nature of technological investment. Finally, the largest limitation is the social-cultural consciousness in which this policy must be instituted. There is a lacking of a sufficiently potent legal framework in which policy makers can instate progressive legislature in the face of corporate backed lobbyists. This report will provide an analysis of the costs (both physical and economic) of sugar overconsumption. Secondly, it will outline a possible strategy for the redistribution of the potential savings that incur on the medical system as a consequence of said overconsumption. American, and undoubtedly global, society is facing a pandemic as a result of the overconsumption of sugar. These consequences spread to encompass the healthcare system, the professionals that take part in them as well as the research that seeks to curb these issues. Chronic illnesses such as diabetes and heart disease are taking a toll on these social systems as they become more and more prevalent. Although the medical research has yet to conclusively show that sugar overconsumption is the definite cause of these diseases and their devastating products, there is strong pre-conclusive data and correlational studies that show their intimate connection. Currently, the trend of sugar consumption is increasing among Americans of all age groups (even though the total consumption of soda is decreasing) [See Fig. 1]. The mean level of recommended sugar consumption continues to increase which contribute to the continued emergence of exceedingly costly medical conditions. Figure 1: Per Capita sugar consumption globally from 1996-1996 to 2010-2011. Source Sucden. This increasing trend correlates with a 2009 study, which culminated the total percentage of global populations of obesity. 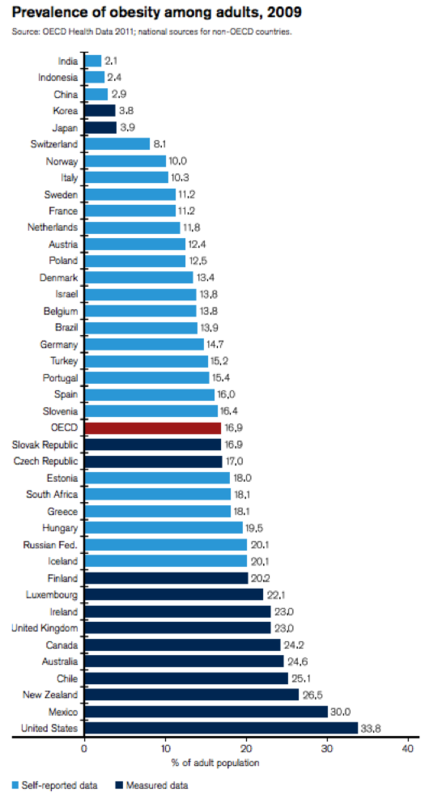 The United States (along with S.A, which has a very high excess also) has the highest percentage of obesity in the adult population [see Fig. 2]. Numerous studies show sugar consumption, in particular higher then recommended consumption, as having harmful effects on health, particularly over time. These consequences do not solely manifest themselves in the form of physical illnesses like the typically associated diabetes and coronary heart disease, but also on the brain as well. The process by which diabetes takes place has shown to be connected by how sugar consumption is mediated by the hypothalamic region in the brain. Excess can cause an RNA stress response in this region that then induces regional inflammation. This hypothalamic inflammation has show to be connected with both pre- diabetes as well as type-II diabetes. The eclectic nature of maladies that are connected with sugar show an increased positive correlational link when looking at increasing trends. As sugar consumption increases, so does the prevalence of these diseases. Because of that, the pressure that it is putting on the medical system and its ancillary spheres increases in tandem. Figure 3 shows the clear financial impact that it would take to try and remediate this growing epidemic. Between 2007 and 2020 the total percentage of adults who have diabetes (whether it be pre-diabetes, undiagnosed diabetes, type-I or type-II) will increase from the very high 37% in 2007 to a staggering 51.9% in 2020. The costs that follow suit increase in an even greater proportion. The total cost increase during this time frame is from 153 Billion USD in 2007 to approximately 3.351 Trillion USD in 2020. The costs are only for the mediation of the increase in diabetes and do not reflect the other harmful diseases that are closely connected with excess sugar consumption. For the purposes of this report, however, the vast cost (and potential savings) of sugar remediation and thus diabetes cost decreases will serve as an ample paradigm in the benefits of reduction of ESC and redistribution of savings. Regulation of ESC, even in the face of the growing socio-economic pressures, faces notoriously potent political constraints. Firstly, the nature of sugar cultivation, production, importation, distribution, and utilization crosses over a large number of spheres and is influential in many businesses. Because of this it becomes incredibly difficult, if not impractical, to regulate sugar itself. Secondly, sugar - being an essential constituent of many large corporate bodies’ products – becomes the center focus for lobbying efforts on behalf of these corporate bodies. Their influence in all levels of government to ensure that they do not face any stringent regulations is potent enough to ensure that their interests are kept. This, plus the lack of a strong enough legislative framework to enact regulation on ESC, makes it evermore difficult to pass regulatory legislation. Lobbying in this area has been quite fierce. At the top, stands the “global sugar lobby,” often regarded as the most powerful commodity lobby behind that dedicated to preserving the interests of the oil industry. With governments promoting artificially high prices for sugar, and implementing quotas to protect the labor bases devoted to sugar beet and sugar cane (equivalent to government subsidies), there is little interest to reduce sugar consumption among those in charge of agricultural policies. SCAAC describes legislation that was proposed, but eventually rejected on account of interested business parties backed lobbies that emerged. This emergence would most likely occur under future attempt to propose regulatory legislation on ESC. Although these political-economic constraints exist to restrict the implementation of legislation, similar resistance was faced, and still is, on the regulation and taxation of cigarettes. SCAAC shows how the regulation in the form of taxations has helped to decrease the overall purchase and use of cigarettes. For every 10% tax increase on cigarettes, the consumption dropped by about 5-7% [see Fig. 4]. Likewise, government and policy makers who have utilized this taxation strategy have redistributed the gained income to fund both the campaign to reduce cigarette purchase and consumption, as well as to mitigate the related costs to health care. Although such a tax would not entirely solve this epidemic issue, it would begin a trend in social consciousness that is already beginning to reduce ESC. This would initiate the downward trend of obesity rates, diabetes emergence and all of the financial pressure that it imposes on the medical system, while at the same time shifting both savings and tax profits to the government that can be used for health research and ESC remediation. Figure 5: Estimated savings opportunities for initiatives to address diabetes in US adults, by public payers, 2011-2020. Source: UnitedHealth Group Modeling. All initiatives would enable a potential savings 150 billion USD for both the federal and stat level governments as well as a total savings of 250 billion USD for the medical system; all over the period from 2011 to 2020. These initiatives are currently being sought by the public systems, as well as corporate initiatives by the largest users of sugar like Coca-Cola and PepsiCo. The cooperation and mutual desire to reduce ESC, even in the face of a rising trend, could eventually lead to a downward curve of consumption and a positive correlation increase in both saving and health. The key however is to push for these initiatives and to be equally as fervent for positive change as corporate lobbyists are for status quo. ¬ From 1996 to 2008, the annual MS incidence rate was stable (average: 7.8/100,000), but the prevalence increased significantly during the 18 year period. ¬ Nearly one in every five Medicare dollars is spent on people with Alzheimer’s and other dementias. In 2050, it will be one in every three dollars. The prevalence of these diseases reflects the need for radical changes in both social consciousness as well as policy initiatives to initiate a positive change. As mentioned in the prior section, the cost of ESC is radical, but through proper initiatives this can be curbed and the savings and tax money moved to public coffers. The Estimated initiative to reduce ESC, as predicted by UnitedHealth Group Modeling shows that we could shift large portions of otherwise reactive expenditure to more useful initiatives. This does not count the potential tax revenue that would be brought in by means of a soda tax. As mentioned, the constraints of this redistribution plan, and the efficacy are not clear. However, the potential to begin balancing health care and public costs, as well as individual health are beyond measure. Simple initiatives that raise public awareness to the costs of ESC as well as its effect on the budget and medical system are invaluable. To continue on the current path leads us to the inevitability of a downward socio-economic decline. The costs will only manifest themselves as a depressive economic state, with a slim possibility of ever balancing, let alone eliminating, national debt. Along with other policy initiatives in other spheres, the funds will manifest themselves as usable assets in combating this downward dilemma. All that is needed is a strong enough initial push to get the ball moving. Elevated Blood Sugar Shrinks the Brain. (n.d.). Retrieved October 10, 2015. Luntz, Stephen. (2012). Sugar Shrinks the Brain. Australasian Science, 33, 9, 7. Welsh, J., Sharma, A., Grellinger, L., & Vos, M. (2011). Consumption of added sugars is decreasing in the United States. American Journal of Clinical Nutrition, 726-734.